"It started as a lark, then it took on a life of its own." "I started a blog to organize my recipes, then discovered the world of food blogs." Both could apply to Weekend Herb Blogging, whose first anniversary is being celebrated this week at Kalyn's Kitchen. Stop in to chuckle over the first lark-ish weeks, then see all the nationalities represented in Week 51. And for Week 52, you play too, even if you haven't before, for the anniversary. Hmm. The everyday-ness. Suddenly I knew, no question, no debate. Hello, my name is Alanna and my favorite herb is the chive. Yes, the lowly chive, it's my choice for my deserted-herb-island even if it's always last on ingredient lists, even then, usually 'optional'. Four seasons a year, I step outside just before supper to snip off a few strands for a salad, for a soup, for potatoes, for meat, for dessert ... well, not dessert, not yet anyway. And here's a lovely little salmon chowder topped with those few snips. 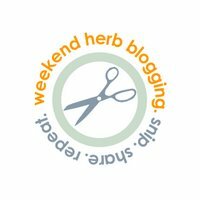 how Weekend Herb Blogging started as a pet-less lark, then, with a life of its own, has come to represent the creativity and community of the world of food blogging. Thank you so much. You've done a great job capturing what I had hoped the event would be. I know it's impossible to choose. But forced choices can be very interesting. I had an herb in mind I thought would win,hands down, but so far the responses are quite varied. Your vote for chives is duly recorded! Yes indeed, chives are wonderful. I particularly like snipping the flowerettes from the flowers and using them to garnish fish or scatter in a salad... mmm, or how about chives scattered on hollandaise? Alanna you might make me attempt to use my underappreciated lowely chive. I keep it because it was the first thing I remember growing from seed and it has survived for 3 years. Yes! Potato soup without chives wouldn't ever be the same. Jeff ~ For what they are? What? You don't appreciate the lowly chive? E ~ yes the flowers are so pretty ... the purple ones in spring but also, just a month ago, tall Queen Anne's lace looking ones from garlic chive in a big pot on the patio. Chives are wonderful in potato salad!! I grow bunch of them every summer!! Btw,your Pepper Steak & Mushrooms looks yummy!! 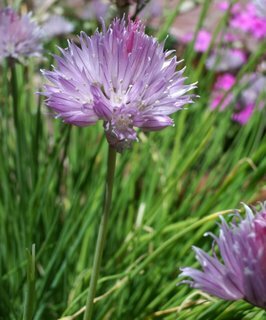 I love chives, as much because they are the first herb to bloom in my garden as for the taste. The salmon chowder looks divine (I'm a big fan of the fat-free half 'n half, too); fresh fennel bulb and salmon are such a wonderful pairing. Thanks for the recipe. Alanna, I have divided it many times and go through and pull out the dried up shoots. A friend moved into town and I gave her some in a bake potato pot and have passed on other parts to friends but I just can't seem to like using it. Do the garlic chive flowers have the same flavour as garlic chives? 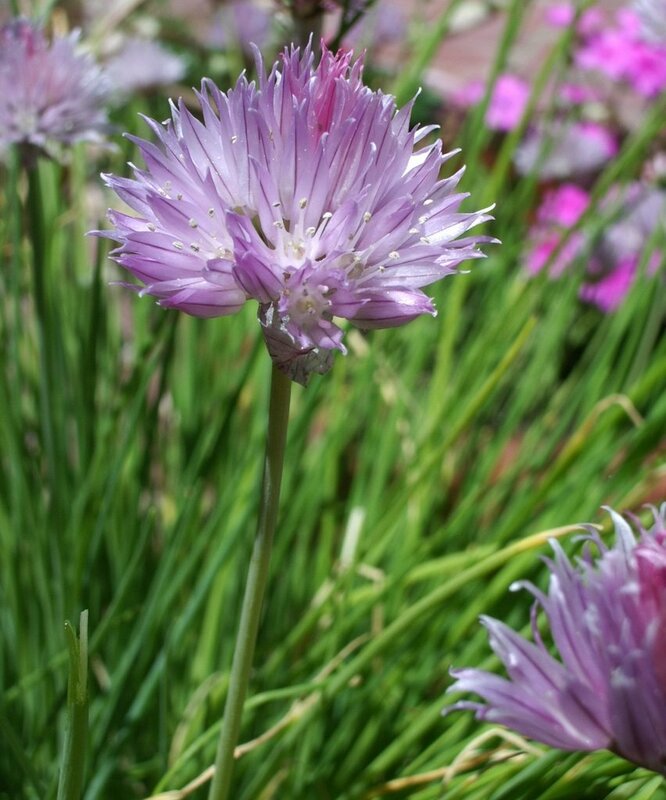 Hi Elizabeth ~ I can't say on the taste of the flowers, I suspect that the chive flowers may not be edible. They emerge from tall sturdy stems, two feet or more. And honestly, they're too pretty and showy to cut! Next year I plan to put in a few plants in another garden, just for the flowers! I'm thinking that the flower must be edible. I wouldn't bother with the stem though. Because you're right, both the stem of regular chive flowers and garlic chive flowers are awfully tough.